Glowing Fireworks - Tape some inexpensive glow bracelets to dark paper for glowing fireworks. More details in this post. 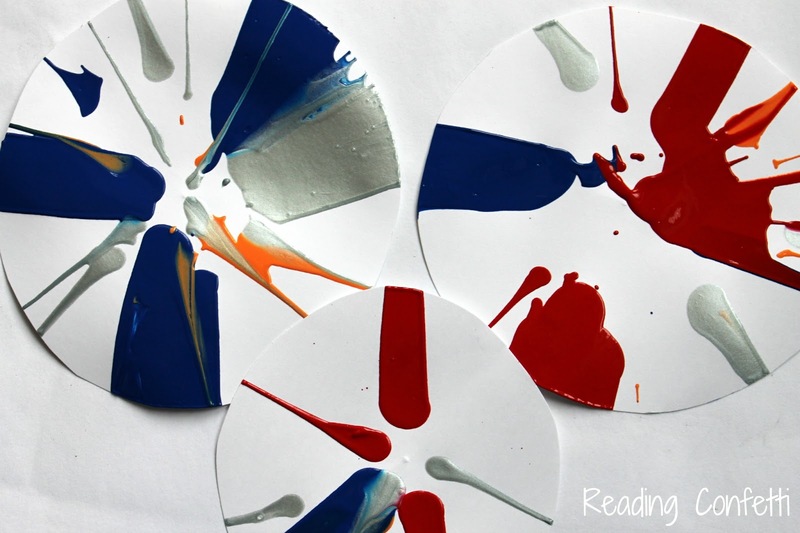 Sprinkle Fireworks - This is one of our favorites and so easy that even the littlest ones can participate. 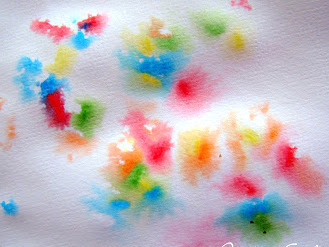 Pour some ice cream sprinkles on paper, mist them with water, and let them dry. You can get the details here. 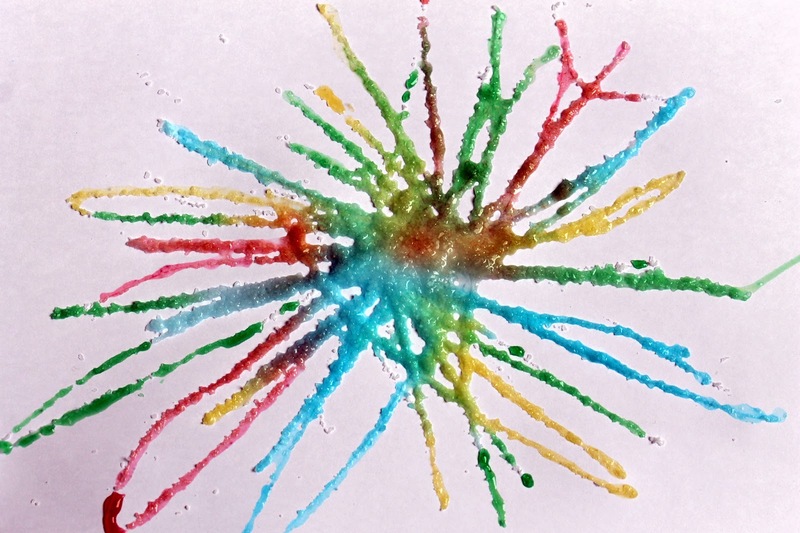 Salt Fireworks - This is another favorite in our house. 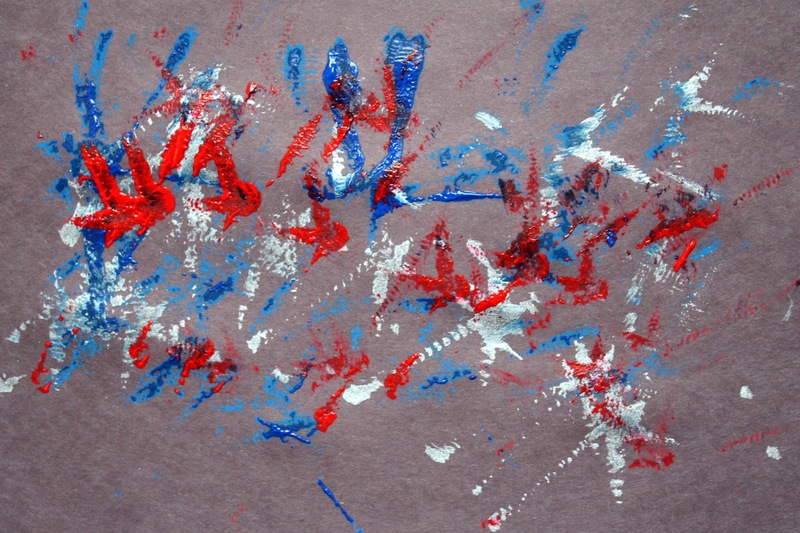 Use regular white glue to make firework shapes on paper. Sprinkle with coarse salt. 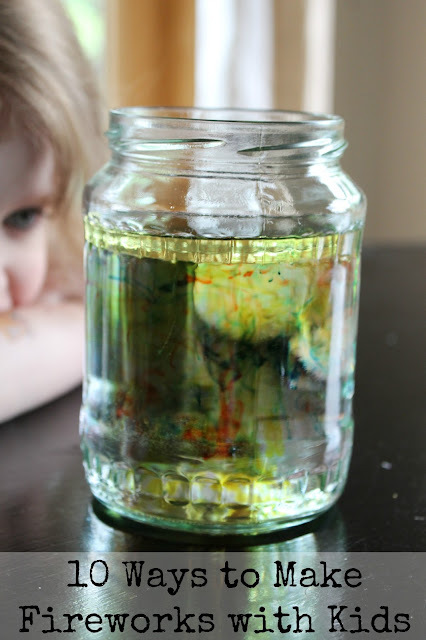 Once it's dry, drip some colored water onto the salt and watch the color "crawl". More details here. 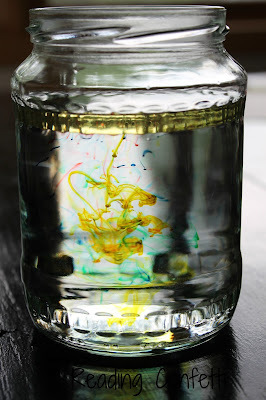 Fireworks in a Jar - Fill a clean jar with warm water. Put a few tablespoons of oil into a separate bowl. Drip food coloring into the oil and mix it very gently to break it up a little bit. Slowly pour the oil into the water and wait for the fireworks to start. More details and an explanation of the science behind it are at Action Pack Magazine. 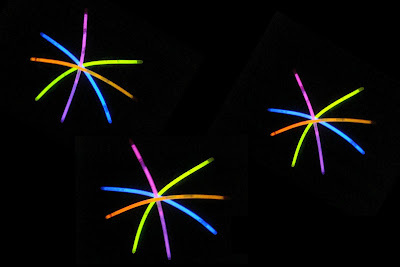 Firework Stamps - Bend pipecleaners into firework shapes and use them to stamp colorful firework shapes on dark paper. Silver was our favorite, but next time we're also adding some glitter. More information at Spoonful. Salad Spinner Fireworks - Get out an old salad spinner and tape some paper in the bottom of the basket. Drip some paint in there and let the kids go. 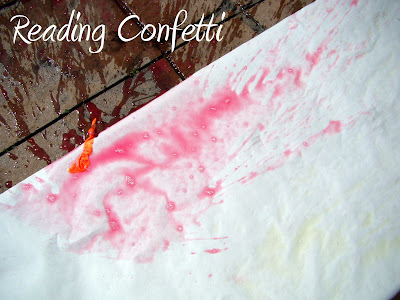 Water Balloon Fireworks - Fill water balloons with a mixture of water and paint and let the kids throw them at a large piece of paper to create exploding firework art. More details here. Flyswatter Fireworks - Pour small piles of paint on paper and use a flyswatter to create paint fireworks. 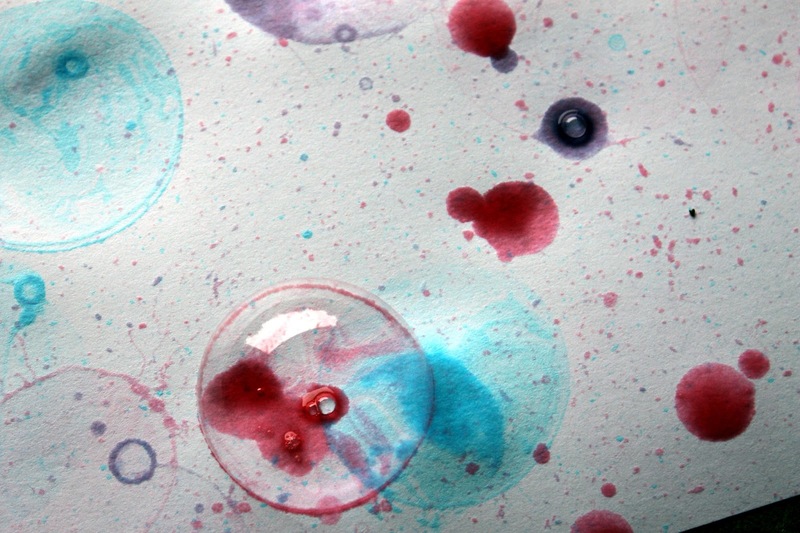 Bubble Firework Art - Mix food coloring and bubbles. Let the bubbles pop on your canvas (paper or the sidewalk) for firework art that even the youngest kids can do. 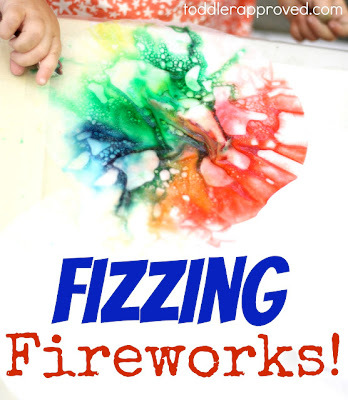 Fizzing Fireworks - Toddler Approved created some fun fizzing fireworks. Did I miss any? We'd love more ideas! Have you ever marble painted? My kids do this all the time on preschool. Put a piece of paper at the bottom of a box. Roll a marble in paint then drop on box and move the box to roll the marble. 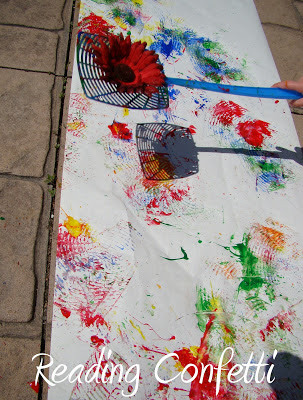 Or drop small amounts of paint on paper and roll a buch of clean marbles in the box. Do res white and blue for 4th. One each hour to prevent color from mixing! Thanks for sharing our fireworks activity in your post! 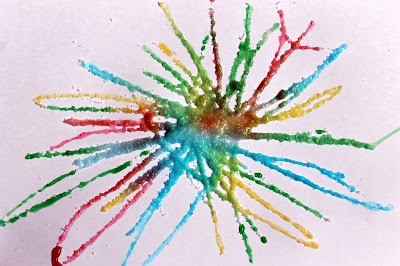 These are all such wonderful and colourful ways to paint fireworks. Lovely! I found this post through pinterest - a wonderful round-up! Thank you!! for Guy Fawkes Bonfire night! Great craft idea!! I posted a link to this on my blog about how to “Spend New Years Eve with Your Kids” It gives ideas for crafts, games, and activities to countdown to the new year. Thanks! I love these ideas! I also used this on my blog today and linked to this website - as an artist...I'm inspired by your salt idea! This was where I featured your post - let me know if you want me to credit this link in any other way!